From Damiano Serlenga (ESA), Baikonur Cosmodrome, 19 March 2012 Still snowing here in Baikonur! 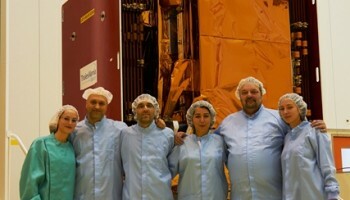 This photo of the team was taken in front of the MIK-112 after Test Review Board of the ‘satellite health check’. 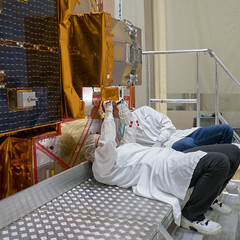 This test confirms the instruments on MetOp-B are ‘alive’. 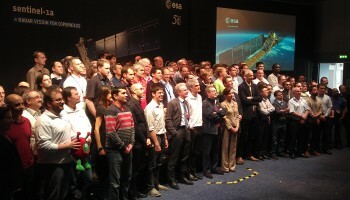 There were about 80 of us involved in the test, including support teams from Europe, USA and Canada. The whole teams has been working a double shift for a week to get through the test. 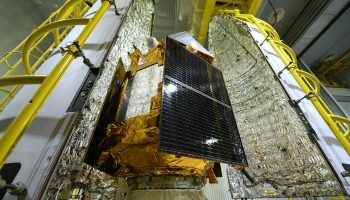 Everything has gone well and we’re now ready for the next milestone: integrating MetOp-B’s solar array.